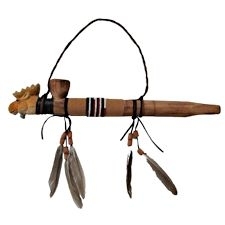 This fully functional wood peace pipe is about 12" long. It has a carved and painted moose head. The stem has leather wraps and a section of multi-color glass seed beadwork. 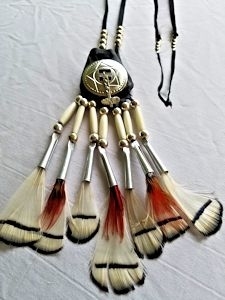 It has a leather hanger strap and leather fringes decorated with wood beads and duck feathers.